One voice plus one guitar makes a very powerful sound. 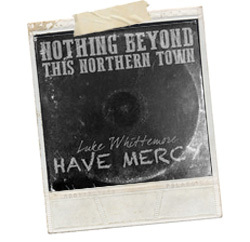 Apart from the zillion high profile and over commercialised releases for Record Store Day, genuine bonafide Single releases are few and far between these days; so when Luke Whittemore sent this disc I was understandably intrigued. The two tracks that make the Double A-Side (as we used to say) are similar in as much as they are folk songs sung by one man playing an acoustic guitar; but the content is poles apart. Have Mercy is a Dylanesque bittersweet love song; and I only say ‘Dylanesque’ because Luke plays simple chords and blows a mean harmonica; but to my ears there’s more than a passing nod to Townes Van Zandt’s drinking buddies in the construction and delivery. This is American Folk thankfully; not English Folk Music. Nothing Beyond This Northern Town is just as simple a lilting Folk song; but with a very subtle Political subtext that could get lost; if not listened to as intently as I did or under a bigger production. Whittlemore has a clever way with words on both songs. But specifically on the latter, the deadpan way he sings ‘there ain’t nothing wrong with a fire in your heart/it’s your unsatisfied mind that holds the key’ makes the message even more powerful than anything we screamed during the heady days of Punk Rock.